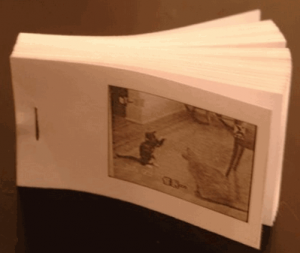 A flip book (sometimes, especially in British English, flick book) is a book with a series of pictures that vary gradually from one page to the next, so that when the pages are turned rapidly, the pictures appear to animate by simulating motion or some other change. I was really amuzed when I saw my first Flipbook in my childhood, and wondered for a long time how did they make one. So, today when I found this free software to create my own Flipbook, it was almost like having those old memories back. FlipBook Printer is a free software to create your own flipbooks. You just need to provide a small avi movie, and FlipBook Printer will turn that into a flipbook. The Flipbook is created in such a way that it can be printed on business cards paper. So, just put lot of blank business cards in your printer, and you can print out your flipbook. This flipbook creator is really easy to use. You are not allowed to use it for commercial purposes to create flipbooks for selling. But you are free to use it for personal use. Love it!